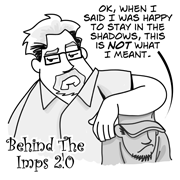 Eventually, if you stay with Luci Phurr’s Imps long enough, ALL the puzzling things in life get explained. And it’s usually Team D. behind it. Their leader, naturally, takes the credit f–er, I mean, is the one responsible for the ads during every Superbowl. So, she is the one responsible for lysol? Past experience suggests Team G has a bit to answer for, as well. Brings back memories of third grade; My teacher abused that stuff. We secretly thought she did it so we wouldn’t/couldn’t talk, but it’s probably just because her sense of smell was fading with old age. Love that evil grin! She’s one of Ms Devil’s. I bet she also did ads for tv evangelists, too. She’d be great at it!